Add Cor5aire as an RSI friend to join the party. Last years Grey Cat Social Event was an absolute hit with the community. Let’s get as many Grey Cats in one crater as possible. Let's all get together and have a Grey Cat party and fun run. Daymar Rally staff are either on holiday or have large work commitments. An extra day will be added to the practice schedule in January 2020. Prize Pack announced in July 2949. Cor5aire will be answering your questions after an announcement regarding the plans for the next 12 months. The AMA will be replayed on YouTube so that there is record of the changes and announcements. This event requires a little home work. A huge part of preparing for the start line is getting to the start line. If we could instantly spawn there as a party that would be rad. If 3.5 is live we will proceed as below. If we stay in 3.4.3 we will fly down to Daymar like normal. If a smaller groups wants to attempt a PTU test with me that would be fantastic. If everyone could attempt to fly a spacecraft with the ability to log out close to Shubin Mining Facility on Daymar. Keep your distance as it appears that being in close proximity to other players has a chance of interrupting your spawn. If you park 10KM's out of Shubin you might be safe. The ship you choose isn't too integral unless you, or at least one member of your team wants that ship to participate in the race as a support craft. As long as you can log out on Daymar. If some teams can store their race vehicles that would be fantastic. It's not integral as we will be close to the vehicle pads. Ultimately the aim will be for teams to spawn on site with vehicles ready to go. It will be good to see where persistence is at right now and watch it improve as we lead into 2950. When we start to invite participants to the party at 20:00 UTC. You should already have logged out on Daymar. Once everyone is invited to the party we will attempt to persistently spawn as a group. Maximum 30 mins after we launch the server we will begin the race from the start line we used for the 2949 Daymar Rally. The race will be to Eager Flats (Cor5aire will be the checkpoint) which will include proper check in procedure. Once checked in return to Shubin Mining Facility and finish on any large spacecraft landing pad. Live Fire will be announced over TTS that it is now live. Teams may then fire upon each other. We will commence a TTS test before we begin the race. The winner of each division will receive a copy of the Daymar Rally short story collection currently in production. THIS IS AN ALL DIVISIONS FULL DAYMAR RALLY COURSE RACE. This is the last chance for teams to practice against their competitors. This will be a full stream test, full camera team test and we will be racing across three servers. Keep an eye out on our Twitch page, myself and the tech team will be testing stream assets live outside of this event also. THIS WILL BE OUR FIRST SPLIT DIVISION SERVER TEST. WE WILL UPDATE THIS POST WITH YOUR SERVER TEAM ORGANIZER. We learnt a hell of a lot from our last practice run and are looking to take it that little bit further. More cameras, better transitions, better frames rates. Join us and help us make the Daymar Rally the largest Star Citizen racing event of the year. Instructional Stream - CitizenCon Recap and 3.3 Run. 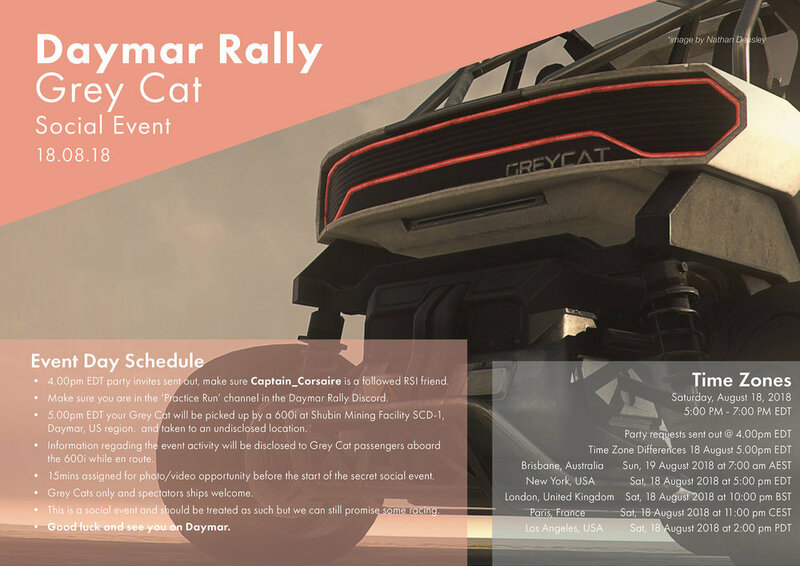 Join Cor5aire and three additional members of the community as we race and talk about different aspects of the Daymar Rally and it's divisions. The Daymar Rally has won a very rare booth spot at this years CitizenCon in Austin, Texas. If you are a current team or if you sign up at CitizenCon, come and visit Cor5aire, Momotaro and Rosseloh to pick up your Version 3.0 36 Page Rule book and poster pack. We are looking forward to meeting the community. Cor5aire will be attending the Maggie’s May’s the night before also if you want catch a beer. How good are your Support Pilots? let's test them out!! Add Captain_Corsaire as an RSI friend to join the party. Rules will be issued two weeks before event. Putting the Ursa Rover through it's paces. Join Cor5aire and a guest support pilot from the community for our new regular instructional stream. Tune in to hear great detail on the rules surrounding the Daymar Rally as each month we will race in different divisions to not only highlight rules for the members but to also try and learn as much as we can about the terrain and vehicles. Please post any queries you have in Tiwtch and we will dedicate a portion of the stream answering your questions. 3 prize packs for January launch date will be announced on the 1st of July along with an interview with Cor5aire. The Daymar Rally team has been scouting locations and collecting footage for the upcoming prize pool release. Tune in to Twitch for the broadcast and playback on YouTube. The trailer will be introduced by Daymar Rally founder, Cor5aire. Tune in on the 1st of July 2948. Stress testing the updated Grav Lev system. All vehicles from the bike division only. With service beacons coming in we thought we might try out the new mechanic. Starting at Eager Flats Emergency Shelter we will place service beacons (players with distress calls) along the second leg of the course. Support craft are included in this test and it may be a good time for you to test out your team work. First one to reach all beacons will receive some loot. Meet us at Eager Flats Emergency Shelter and we will be starting at the below times, no later. 3.1 will hit us early April and we need to put the Cyclone through it's paces. 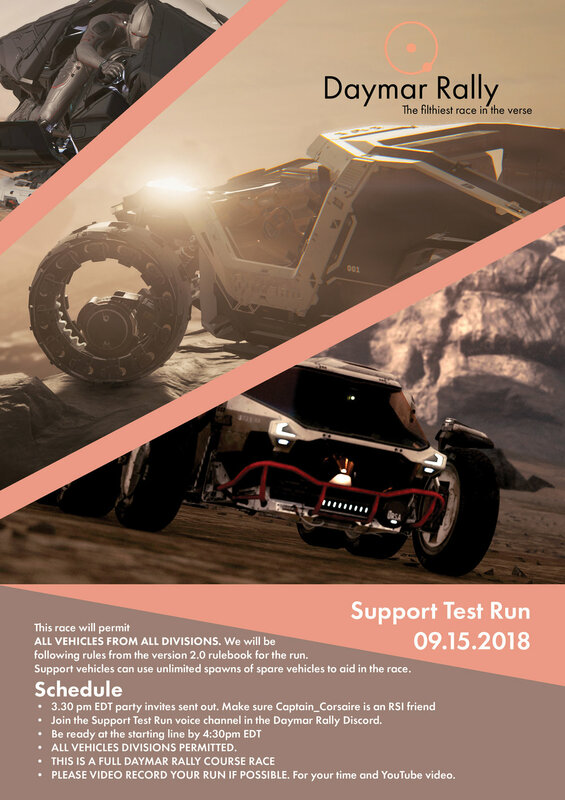 If you have a Cyclone bring it along to the Daymar Rally Cyclone test race. Daymar Rally organises will be testing times between outposts, speed and durability vs other divisions. If you don't have a Cyclone bring your Ursa, Dragonfly or Nox anyway. Meet us at Shubin Mining Facility SCD-1 and we will be starting at the below times, no later. Meeting for all current community contributors to discuss, ideas tasks and organize deadlines. 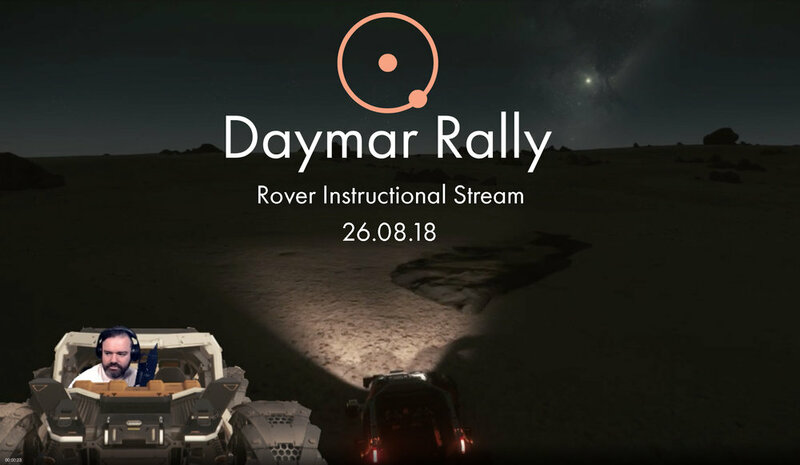 Daymar Rally organizers will give you a run down on where we are at and how you can help out. If you would like to attend, get in contact with us on Twitter and we will issue the Discord information. If you have been contact with us regarding involvement but haven't been to a contributors meeting before, come along and Corsaire will introduce to everyone. We would love to hear from you.